Installation view of Emissary Sunsets The Self (2017) in the exhibition Ian Cheng, Carnegie Museum of Art, 2017. Photo: Bryan Conley. Working as a curator of contemporary art at the Carnegie Museum of Art in Pittsburgh, I have the pleasure of collaborating with artists to realize their exhibitions in a space we call the Forum Gallery. The room has hosted a rotating program of new artworks in a variety of media since 1990, and because Forum is on the ground floor of the museum adjacent to the main lobby, it’s the most visible space for art at the Carnegie. One may be visiting the museum to view the Impressionist paintings, or the dinosaur display down the hall at the Carnegie Museum of Natural History, but the first thing one sees when entering the museum is contemporary art, which tunes the mind to a state of discovery. The usual installation in Forum may offer a suite of paintings or some new photographs, but recently visitors were confronted with something out of the ordinary: a computer-generated live simulation by the New York–based artist Ian Cheng. 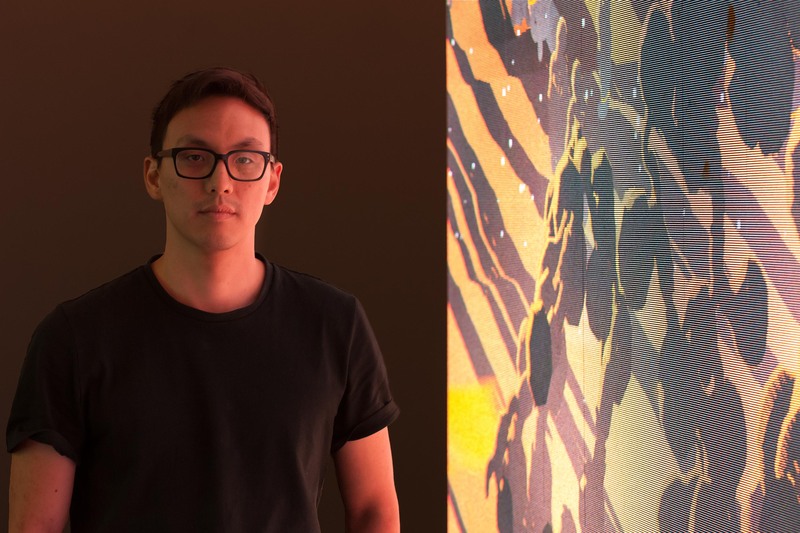 Drawing on his background in cognitive science and his research into artificial intelligence (AI), Cheng develops immersive fictional worlds on Unity, a popular video-game publishing platform. However, unlike traditional video games, Cheng’s simulations have minds of their own; they are constantly changing, unpredictable, and indefinite in duration. When Cheng and I began discussing the prospect of a show, he was absorbed in the final stages of producing Emissaries (2015–17), a trilogy of live-simulation works that represent his interpretation of the past and future of cognitive evolution. While the three episodes occur thousands of years apart, Cheng’s imagined setting remains the same: an evolving volcanic atoll populated by creatures of his invention. His protagonists, or Emissaries, are equipped with composite AI models built using reinforcement-learning algorithms. These sentient agents shape and are shaped by their strange environments as they work to accomplish narrative tasks based on programmed needs and desires. We decided to exhibit the final chapter of the trilogy, Emissary Sunsets The Self (2017), which is set millennia into the future. In this part, the formerly lush and verdant atoll is now a barren landscape populated by a meerkat-like species, which has been genetically engineered to rid the environment of mutations prompted by an all-controlling intelligence called MotherAI. Gazing into one of Cheng’s imaginative simulations is like peering through a microscope and witnessing the alien behavior of single-cell organisms. That said, there is something uniquely human about the intentions and actions of Cheng’s strange beings. One minute they appear to cooperate, and the next they abuse each other. Intermittently, they kneel together in contemplation, as if sharing the same mystical beliefs. Cheng’s simulation is a social one—it models relationships, needs, and desires over time—and his perspective is unflinching, with the camera recording everything that unfolds without any narrative emphasis. At the level of its apparent subject, Cheng’s simulation offers viewers a glimpse into an alien public whose behaviors he can condition but not control. Ian Cheng. Emissary Sunsets The Self, 2017, live simulation and story, infinite duration, sound, Carnegie Museum of Art, A. W. Mellon Acquisition Endowment Fund, 2017.32 Courtesy of the artist, Pillar Corrias London, and Standard (Oslo). Emissary Sunsets The Self may look like an animated film, but it differs fundamentally as an open-ended computer program and as a visual display. It doesn’t depend on a start time, and there is no beginning, middle, or end. A causal narrative doesn’t drive the viewer’s emotions or identification to a predetermined conclusion, and one can choose to observe for a few seconds or a few hours. The continuously evolving form of a live simulation raises a host of questions about spectatorship, the visitor experience, and museum spaces. Museums often show moving-image works in “black box” environments that offer darkness and a sense of immersion conventionally associated with the cinema. But Cheng and I were interested in how we might use his show to rethink expectations about the public address of art in the Forum Gallery. During his earliest planning visit, Cheng immediately saw the potential of the site and wanted to amplify the public visibility of his simulation and its dialogue with the framing architecture. Using a seventeen-foot LED screen, we could show his work without the hermetic enclosure of a black-box space. The work could be viewed from the lobby, from the nearby sculpture courtyard, even from the parking lot one hundred yards away. And, because the simulation runs continuously, Cheng’s work lit up the closed museum at night with its pulsating, digital glow. The sheer size of the screen in the rather small gallery upended the usual architectural relationship between artwork and space. Cheng’s simulation consumed the room, transforming the white cube into an alien habitat. The gallery’s threshold became an imagined barrier, prompting visitors to peer in while the artwork seemed to look back. Another facet of the installation involved Wi-Fi-enabled LED lightbulbs that shifted in color and brightness in synchronization with the day-night cycle of the world depicted in Emissary Sunsets the Self. These emphatic presentational choices commanded attention, in effect putting spectatorship on display. The public lobby, through which visitors routinely pass on their way between wings of the museum, became a site of distraction and immersion, a strange environment not unlike Cheng’s imagined atoll. The power and draw of his simulation is in large part due to the way it defamiliarizes our museum-going routines, casting us as agents in our performance in institutional space. Today, the small screens of our mobile devices encourage us to look downward and inward; our personal media environments feed us imagery and news that reinforce our perspectives and preferences. These individual experiences now seem to compose our public sphere. Museums have the potential to puncture our private bubbles with the shared experience of artistic expression, and artists like Cheng offer us new reasons to look up. Ian Cheng. Photo: Bryan Conley. Forum 79: Ian Cheng was on view at the Carnegie Museum of Art, Pittsburgh from September 22, 2017–January 28, 2018. Eric Crosby is the Richard Armstrong Curator of Modern and Contemporary Art at the Carnegie Museum of Art in Pittsburgh. Previously, he served as the associate curator of visual arts at the Walker Art Center in Minneapolis. His recent projects include solo exhibitions by Michael Williams and Ian Cheng and the group exhibition 20/20: The Studio Museum in Harlem and Carnegie Museum of Art.